Aiming toward the target year of 2020, Mayors for Peace adopted the “Mayors for Peace Action Plan (2017-2020)” (Overview) at the 9th General Conference held in Nagasaki in August 2017, which set two main objectives that would lead us to our ultimate goal, that of lasting world peace: “Realization of a world without nuclear weapons” and “Realization of safe and resilient cities”. Based on this Action Plan, Mayors for Peace is promoting various projects. Seizing every possible opportunity, including international conferences, Mayors for Peace has called on the UN and governments around the world to support efforts towards the early realization of a legal prohibition on nuclear weapons. These activities and the heartfelt appeal of the hibakusha and many other like-minded people who wish for the abolition of nuclear weapons bore fruit in July 2017, when the Treaty on the Prohibition of Nuclear Weapons was adopted at the UN. Mayors for Peace will continue to urge all states, including the nuclear-armed states and their allies, to participate in this Treaty as soon as possible. We will also encourage policymakers to work on creating a security framework that moves away from nuclear deterrence and to visit Hiroshima and Nagasaki to share in the hibakusha’s earnest wishes for nuclear abolition. We call on non-member cities to join Mayors for Peace, not only through invitations from the President of Mayors for Peace and its Secretariat, but also from other associations of local governments, Lead Cities’ partners and other channels. Mayors for Peace selects an appropriate number of Lead Cities that take the lead in their regional chapters in order to encourage proactive and independent activities appropriate to each region. Mayors for Peace is distributing seeds from A-bomb survivor trees in Hiroshima in response to member cities requests. Please join us in this program by nurturing the trees distributed to your city as symbols of peace, and use them to raise peace consciousness among citizens. 1.To raise seeds/seedlings under the care of experts, such as in botanical gardens, until they become tall and sturdy enough to plant. 2.Provide the Secretariat with updates on development of the trees at least once a year. These updates should include some information on their height, number of seedlings, growing place and a plan/report of peace activities based around them as well as their photos. 1.Delivery of seeds to member cities overseas is done by post. As a seedling is not suitable for international postal delivery, the Secretariat can offer a seedling only when it is to be transported in the luggage of someone who is traveling from Hiroshima to the recipient city. 2.When trees from the seeds become tall and sturdy enough to be planted in the ground, the Secretariat can donate an explanatory plaque. Please inform the Secretariat of plans of events involving the tree, such as a planting ceremony. Please be advised that a recipient city can receive one explanatory plaque for each species. If a member city wants to receive seeds from A-bomb trees and agrees to accommodate the requests above, please contact the Secretariat by email. b. The Secretariat confirms whether or not procedures for quarantine, export and import licenses are required by the sending country and the receiving country. Based on the preparatory research in 2 - a, the Secretariat enters relevant information into the questionnaire and sends it to the recipient city. If quarantine or an import license is required by the receiving country, the Secretariat informs the recipient city of this information at this point. a. The recipient city answers the questionnaire by filling in required information, such as tree species they want to receive, intended care facility (e.g. a botanical garden), and contact information, and returns the questionnaire to the Secretariat. b. In the case that some procedure is required by the receiving country, the recipient city should contact a domestic quarantine office for their advice on the procedure, then share this information with the Secretariat. Upon confirmation of the returned questionnaire and the completion of required procedure for quarantine and an import license, the Secretariat sends out seeds to the recipient city. Shipping costs are covered by the Secretariat. A pamphlet introducing this project is available as an easily downloadable, full-color PDF. For anyone thinking of applying for seeds, we invite you to take a look. Please feel free to distribute it to any interested parties (12 page full color booklet). *Print out on 6 double-sided A4 size sheets, fold in half and staple the binding to create an A5 size booklet. In order to realize a “world free of nuclear weapons,” it is essential to foster and increase international public opinion for it. To this end, Mayors for Peace has implemented programs to encourage and inspire younger generations to get involved in peace activities in the future. These programs provide financial and other support to selected youth from member cities who would like to participate in programs offered by Hiroshima City, Hiroshima City University and so on, to learn about the experiences of A-bomb survivors and their desire for peace. In each program, in addition to the existing content produced by each host organization, Mayors for Peace conducts its own programs such as a briefing on Mayors for Peace and testimonies from A-bomb survivors. After completing the program, we ask the participants to propose Mayors for Peace activities for nuclear weapons abolition to their communities and the secretariat of Mayors for Peace. Based on the proposal, each city considers implementing projects. Through our program, we aim at developing human resources and strengthening our member city network. In July 2017, the Treaty on the Prohibition of Nuclear Weapons was adopted at the UN. This was made possible by the heartfelt appeal of the hibakusha and many other like-minded people for the abolition of nuclear weapons. In order for the Treaty to become a fully effective legal instrument for nuclear abolition, we believe it essential for all states, including the nuclear-armed states and their allies, to join this Treaty. Through this petition drive, let us spread our appeal for peace, which is this path toward a world free of nuclear weapons, and create a powerful movement to urge all states to participate in the Treaty as soon as possible! Please sign the petition and show your support for this cause. Download and use this poster to promote the petition on various occasions. In order to give as many people as possible a much deeper understanding of the reality of the atomic bombings and to raise global awareness for the abolition of nuclear weapons, we are asking member cities to hold an exhibition using Hiroshima-Nagasaki A-bomb Posters and other related materials. Please click the button below then enter your password and user ID which will automatically take you to the download page. If your municipality is not a member of Mayors for Peace or you are from an other kind of organization and want to use the posters, please submit the Application Form and materials, such as a plan document explaining your events to the Secretariat. After holding the poster exhibition, please report the result of the exhibition to the Secretariat. In order to further promote peace education in member cities around the world, Mayors for Peace hosted its first children’s art competition inviting children from 6 to 15 years old who live in Mayors for Peace member cities to submit artworks on the theme of “Peaceful Towns”. The competition was open for submissions from October 1 until December 28, 2018. 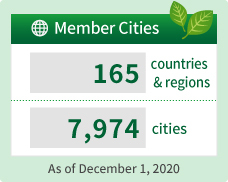 We are pleased that we have received 469 works from 29 member cities in 14 countries and would like to thank everyone that took part in this competition. The judges had a very difficult task of screening the submissions, as the standard of entries was so high, but they managed to select eight prize-winning works. The grand prize artwork will be printed on plastic folders which Mayors for Peace will be using to promote its work on various occasions. The grand prize winner is presented a certificate and plastic folders on which her artwork is printed. The second and third prize winners are presented a certificate. The Flying Angel over the city encourages and raises the soul. If people are kind to animals who live in their city (should not catch or kill them and should feed them), that city will be peaceful. I painted a scene where my friends and I play happily in a park, because that’s what peace means to me. All the people on earth live with a happy heart with the wish of peace, friendship, justice and equality. In my drawing, I depicted a peace dove as a symbol of a peaceful city. The city is safe when the dove is safe. My inspiration for this drawing was the nature of my region. I want all people to know that there is such a beautiful and clean city on Earth – our Uryupinsk. Our Republic is inhabited by people of many ethnicities. The culture and history of each of them is amazing and unique. We try to respect their customs and traditions, to live in unity and harmony, because the main thing for us is the global peace. In my peaceful town, there is a special “conciliation” park where people can go in case of struggle with others. There are experts to help them to make up with each other. In the streets there are no cars, so that children can use their bikes and scooters/skateboards. Mayors for Peace has put emphasis on peace education to raise awareness among future generations as its intensified program in the Action Plan from 2017 to 2020, which was adopted at the 9th General Conference. In order to further promote peace education in its over 7,600 member cities in 163 countries and regions around the world, Mayors for Peace has decided to host a children’s art competition on the theme of “Peaceful Towns” targeted at children in all these cities. Please refer to the Application Guidelines for more information, such as applicant requirements and application details. Please submit to the city hall of the member city where an applicant lives. *If more than the maximum number are received, the member city is expected to screen applications to select 20. Among the high priority action items in the Mayors for Peace Action Plan (2017-2020) adopted at the 9th General Conference is our efforts to conduct peace education to raise awareness among future generations. In accordance with this, we are writing to ask for your kind cooperation in our efforts to compile good examples of initiatives to foster peace-seeking spirit conducted by our member cities around the world. Through sharing them in our monthly newsletters and on our website, we are hoping that more cities will follow suit and become inspired to launch their own peace education program. In this regard, the Secretariat cordially asks you to provide information about peace education initiatives conducted in your city following the submission instructions below. ▶This Call for Input will be of interest to peace education initiatives conducted by any organization (city hall/school/NGO, etc.) in Mayors for Peace member cities that are conducive to raising peace-seeking spirit among future generations, on themes such as: the atomic bombings of Hiroshima and Nagasaki; the history of war in each member city; terrorism; refugees; the destruction of the environment; poverty; famine; discrimination; violence, etc. ▶Kindly only send information on initiatives that have been completed as of the time of submission of the report. Please email the following two items. In order to maintain consistency between the compiled reports, please use the designated form and write as specifically as possible. Please paste the photo(s) into a Microsoft Word document and attach captions to each photo. ▶There is no submission deadline. The Mayors for Peace accepts reports on a rolling-basis, so please send your report whenever your project is completed. ▶Please note that not all submissions may be published. The Secretariat will select and publish initiatives that can be applied to other cities and if we receive more than one similar initiatives, we will choose one which best represents them.